These clear glass jars and caps are ideal for storing paints, solvents, and other materials around the studio. The jars feature easy-to-clean, wide mouth necks and are fully recyclable. 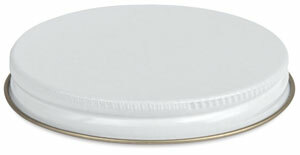 The white metal screw caps have a pulp and poly liner that provides a secure seal.